Have you ever joyfully picked up an apple, shined it, looked it over to find the perfect starting point and the moment you chomped down been greeted by a foul and rotten taste? The apple looked so good from the outside, deep red shiny perfect skin, no bruises, no splits and the stem perched atop at the perfect angle and just the right length. But inside the rotten grainy taste of the fruit turned your stomach. There are many examples in Scripture where trees, fruit, pruning etc. are used to make a point. I think this is because it is something we can connect with, something that most of us have experienced. Not just the rotten fruit but the importance of caring for the tree on which the fruit grows. 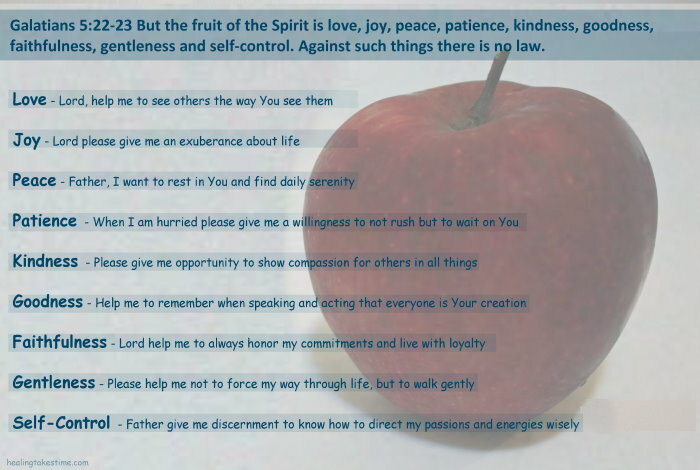 Galatians 5:22-23 Paul lists the fruits of the Spirit, beautiful fruit which should be the centerpiece of our character. Love, Joy, Peace, Patience, Kindness, Goodness, Faithfulness, Gentleness, and Self-Control. I remember memorizing these verses when I was young. The school I attended built it’s curriculum around these fruits and I think I had a firmer grasp on the importance of Spiritual fruit at ten years old, than I have for most of my adult life. I grew up in a strong Christian family with two parents who loved the Lord above all else and who understood the importance of serving Him in all things. My mom modeled all the fruits of the Spirit. Oh I am sure there were times when she didn’t display them prominently, but overall throughout her life she showed love to those who seemed unlovable, joy in her daily attitude, peace in times of struggle, patience with me and all my siblings, kindness to those she encountered, goodness in her words and actions, faithfulness to our Lord, my dad, and our family, gentleness even during times of discipline, and self-control not just when it came to anger or frustration, but through times of temptation and disappointment. My dad also displayed these fruits in his life. As a pastor, he was held to a higher standard and I think, even as a child I could see that his strength of character was not only visible in the pulpit but in all areas of his life. What happens when we intentionally live God’s way? What happens when we pause and look at our lives, our work, our friendships, family, and church and find opportunities to live in the Spirit? When we live in the Spirit God brings the gift of these character traits into our lives, much like fruit in an orchard. My parents have always been such an example to me, I think sometimes I have allowed their ministry and their character to carry me without recognizing that it is my responsibility to care for my own orchard and cultivate the fruits of my own life. My prayer today looks something like this.